The former Holly Square Shopping Center, located between Holly and Hudson streets north of East 33rd Ave., in the Northeast Park Hill neighborhood of Denver, CO, was destroyed by arson in May 2008. The property was purchased in April 2009 by ULC with assistance from the City of Denver’s Office of Economic Development. 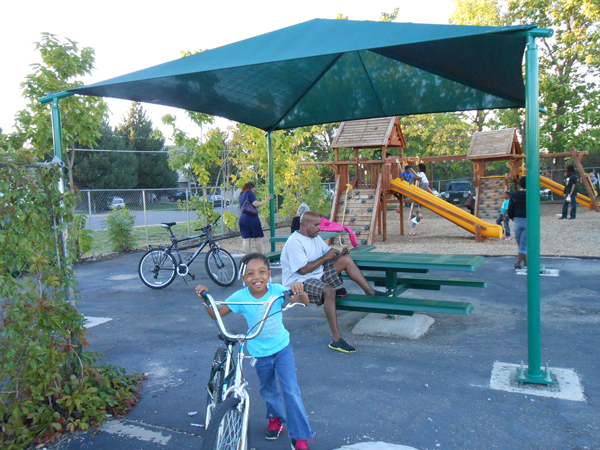 ULC oversaw demolition of the burned structures on the 2.6 acre site, resolved environmental issues, and launched a community visioning process in 2009 with the help of The Denver Foundation’s Strengthening Neighborhoods Program (SN) called Holly Area Redevelopment Project (HARP). HARP has worked for over 3 years to re-imagine the entire six-block area including and surrounding the former shopping center. HARP designed a unique visioning process which was open to the public to create a set of “Good Neighbor Principles” as well as a set of broad design concepts that ULC has committed to using in selecting a developer or developers for the site, and which will provide overall guidance to reinvestment in the surrounding community. The third phase of development was complete in summer 2013 with the construction of a new Boys and Girls Club on the site. ULC continues to own the land under the new center under a 99 year land lease, ensuring that the site will benefit the community for generations. For more information about the Holly Area Redevelopment Project (HARP), please take a look at the HARP Vision Plan produced through a community process led by the Strengthening Neighborhoods group at The Denver Foundation and a local consultant group funded by ULC.